A Saudi Arabia Based banker ended his marriage to a 25-year-old woman in Hyderabad through a newspaper ad. Banker, Mohd Mushtaquddin has been charged by the Hyderabad police with cheating and cruelty. 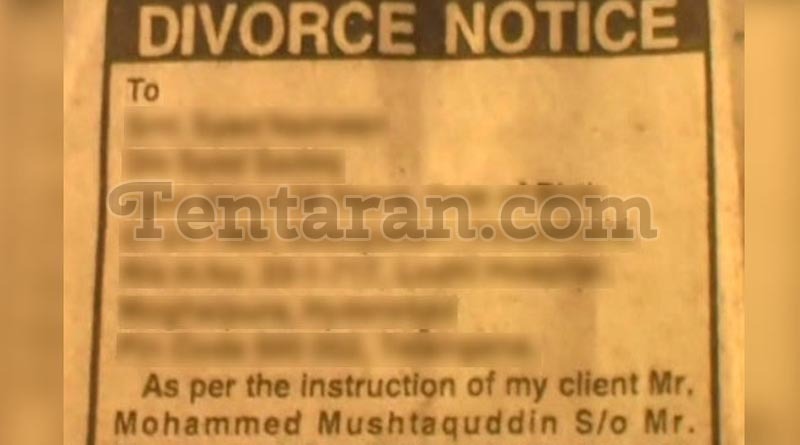 The woman told the police she was shocked to see the ad in a local Urdu daily on March 4. Then she received a phone call from her husband’s lawyer. Mohd Mushtaquddin married the woman in 2015 and took her after five months to Saudi Arabia, where he worked. They had a baby girl last year. Two months ago, they came back to India and woman went to her Maternal home after a fight with her husband. Three weeks after the fight, Mushtaquddin left for Saudi without informing, neither did he answered the phone calls made by the woman. She was told by her father-in-law that Mushtaquddin had returned to Saudi Arabia and was not allowed in their home. ”If I did anything wrong, he should have spoken to me and my parents. If I was wrong he should have given talaq in front of everyone as he has married me in front of all relatives,” the woman has said. ”Why did he run away to Saudi Arabia without meeting me… and divorce me through an ad even with a 10-month-old baby”. Mushtaquddin has harassed his wife for a dowry of Rs 20 lakh according to the police officer, S Gangadhar. Mr Gangadhar said, “We are conducting a probe and also verifying if a divorce announced through a newspaper is valid under the Sharia”.